Your Heart: Prevent and Reverse Heart Disease will be available this month. We are in the final editing process. To give you an early start on some of the book’s content, Lipstick Logic will be posting excerpts. Based on the latest evidence-based research, you will have the information and power to make changes to improve your heart health. Your Heart is a handbook on heart disease. Coronary artery disease is preventable. Caused by narrowed heart arteries it kills more men and women than any other disease including cancer. 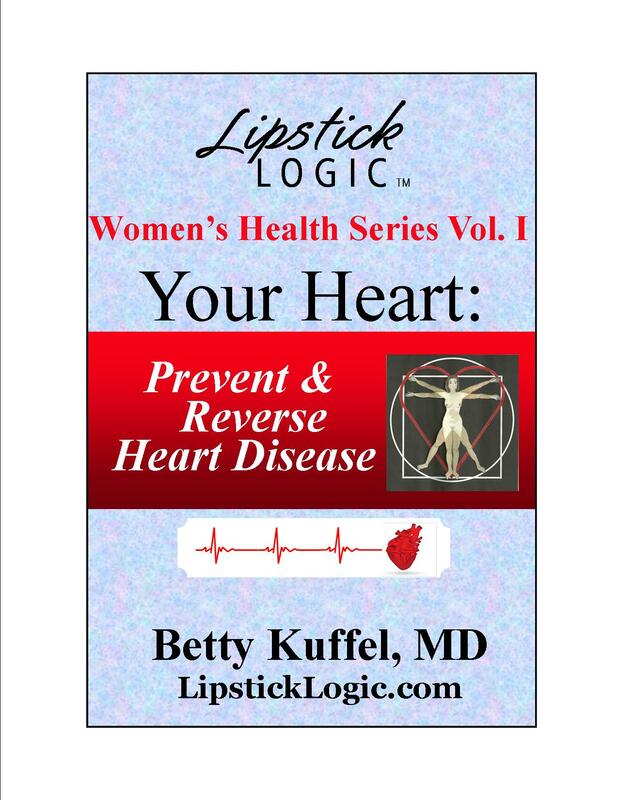 Because one-in-four women die of heart disease and two-thirds of them have no recognized symptoms, learning the information in this book may be life-saving. The heart is the only muscle that never rests. You sleep, but your heart doesn’t. Its built-in nervous system electrically drives this biological engine every minute of your life. Your heart’s neurological pacemaker fires off an electrical impulse signaling the heart muscle to contract. As the muscle contracts, the chamber inside the heart becomes smaller. As the chamber reduces in size, it pushes blood through the aortic valve into the aorta and through the rest of the body. The coronary arteries run on the surface of the heart and with each contraction, blood surges into them to supply the heart muscle with nutrients and oxygen. With each beat about 70 ml (2+ounces) of blood exit the heart. If your heart rate is 70 beats per minute, add it up—your heart circulates approximately 5 quarts of blood each minute. Without this mandatory oxygen distribution to the body life ends. Along with transporting red blood cells that carry oxygen to all organs, the blood carries many other cells, proteins and factors needed to sustain life. This red super-highway carries wonderful nutrients to feed your cells. Swirling throughout the body are cells that fight infection, promote clotting and support life functions. The blood also carries factors, that in excess, cause heart disease and early death. In developed countries throughout the world coronary artery disease (CAD) is the primary cause of death. It is a disease of affluence. We eat not only because we feel hungry, we eat for enjoyment, to pass time, and at social events we munch mindlessly. The fact is, we eat too much and it’s making us sick. Coronary artery disease, the leading cause of death in both men and women, is tied to obesity. Your food choices, portion sizes and exercise interplay, but CAD is more complex than these factors alone. Understanding the anatomy, physiology and dynamics of heart function in health and disease, and actions both men and women can take to reduce related risk factors are provided in the book. The latest research information makes this book a up-to-date valuable reference and includes diagnosis, treatment details and dietary recommendations.